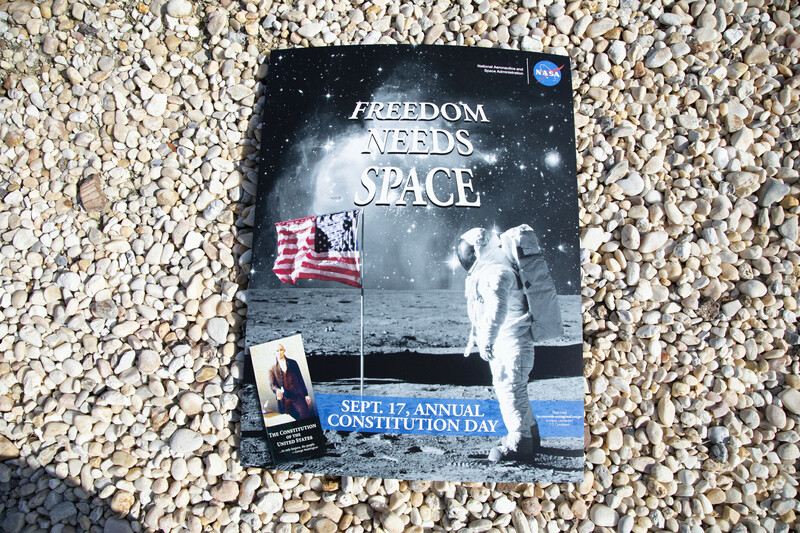 NASA Kennedy Space Center’s use of a technology widely employed in sophisticated manufacturing supports the agency’s space exploration efforts and also has led to improvements in the product’s design. The technology is a sensor called a residual gas analyzer/mass spectrometer, or RGA. At each step in the process of producing complex items like semi-conductors, which can involve thousands of RGAs for process control, the devices can rapidly detect vacuum leaks as well as contamination that, if left unchecked, could result in manufacturing defects. RGAs also can determine the type and location of a leak by identifying its chemical composition. A team at Kennedy leveraged their experience working with RGAs while they worked with members of industry to troubleshoot Kennedy’s thermal vacuum chamber, or TVAC. The chamber can simulate various space environments to test and prepare hardware for flight. The NASA researchers, members of the Water Analysis and Volatile Extraction (WAVE) team, are developing RGAs as payloads for landers to detect resources on the Moon, such as water that astronauts can drink or convert to rocket fuel. During testing of the TVAC, engineers had detected pressure spikes indicative of small, invisible leaks. 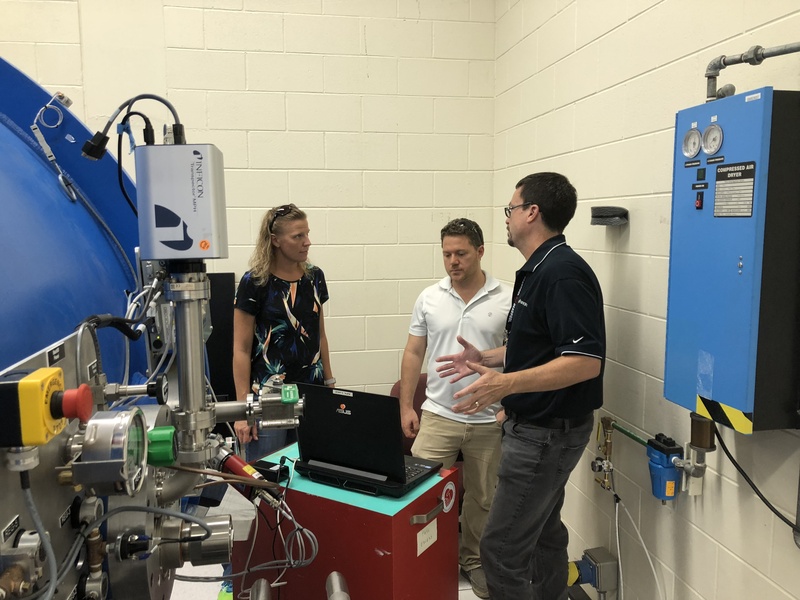 The WAVE team and members of industry demonstrated how to use a RGA sensor to troubleshoot the leaks by identifying gases present in the chamber which would indicate the source of a leak, thus avoiding a costly and time-consuming delay to operations. This was not their first collaboration. The NASA researchers had already put their RGA through numerous flight verifications, and had worked with the vender to resolve issues that arose when adapting the technology for space. Vibration testing, in particular, highlighted several ways in which RGA manufacturers could make their devices more robust. Ken Wright, chief scientist and instrument development lead for sensor manufacturer Inficon, said working with NASA produced at least three direct improvements to the company’s residual gas analyzer. “Our main product is now better because of this collaboration,” Wright said. Employing the RGA sensor to troubleshoot Kennedy’s thermal vacuum chamber while preparing the same equipment for use in space is another example of harnessing innovation to develop the agencies capabilities and using technology to drive exploration. Today, NASA’s Kennedy Space Center in Florida celebrates U.S. Constitution Day, the official birthday of our country’s government. With the theme “Freedom Needs Space,” a remembrance poster makes appearances in various locations around the multi-user spaceport, including the crawlerway, Vehicle Assembly Building and Shuttle Landing Facility. Constitution Day is an American federal observance. It recognizes the adoption of the U.S. Constitution and those who have become U.S. citizens. Constitution Day is observed on Sept. 17, the day in 1787 that 39 delegates to the Constitutional Convention, representing the 13 original colonies, met for the last time and signed the document in Philadelphia. 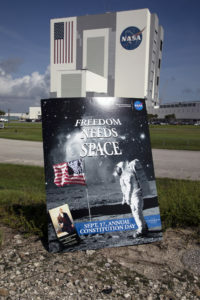 For more information about Constitution Day, resources and activities, visit http://www.constitutionday.com/. NASA’s ICESat-2 spacecraft deployed its four solar panels and is drawing power, indicating it is healthy upon its arrival in orbit. The spacecraft launched on the final flight of the United Launch Alliance Delta II rocket, lifting off from Space Launch Complex-2 at California’s Vandenberg Air Force Base at 6:02 a.m. PDT (9:02 a.m. EDT). Ground stations in Svalbard, Norway, have acquired signals from the spacecraft. It is performing as expected and orbiting the globe, pole to pole, at 17,069 mph from an average altitude of 290 miles. 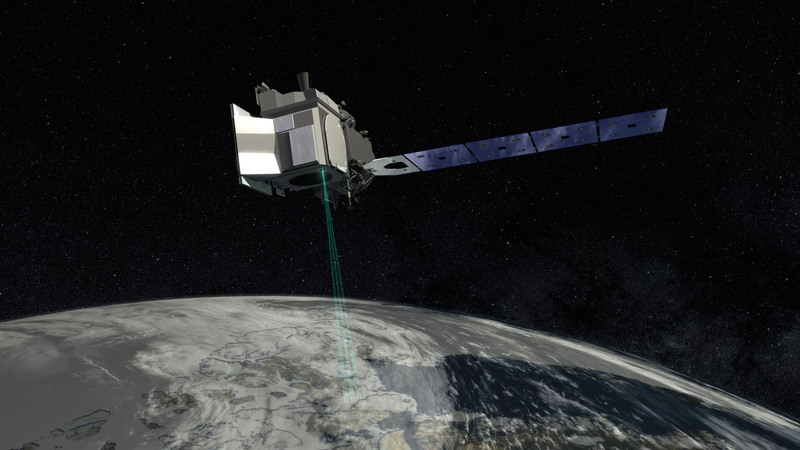 NASA’s Ice, Cloud and land Elevation Satellite-2, or ICESat-2, a mission to measure the changing height of Earth’s ice, is scheduled to launch Saturday, Sept. 15, with a 40-minute window opening at 5:46 a.m. PDT (8:46 a.m. EDT). 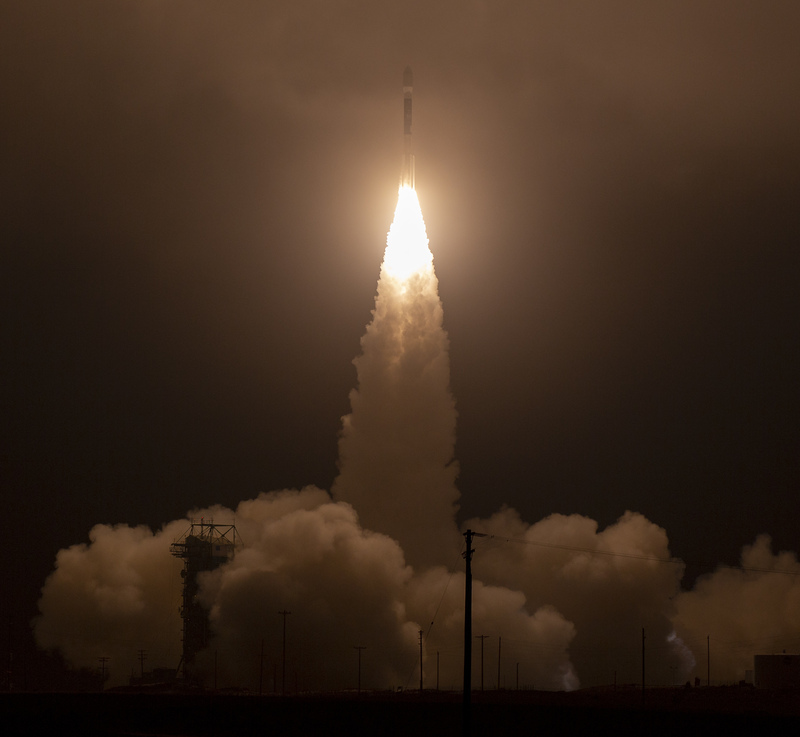 The spacecraft will lift off from Space Launch Complex 2 (SLC-2) at Vandenberg Air Force Base in California on the final launch of a United Launch Alliance Delta II rocket. The U.S. Air Force 30th Space Wing weather officer reported they are predicting a 100 percent chance of favorable weather on launch day. NASA’s Ice, Cloud and land Elevation Satellite-2, or ICESat-2, is being prepared for liftoff Saturday aboard a United Launch Alliance Delta II rocket from Space Launch Complex-2 at Vandenberg Air Force Base in California. The launch window opens at 8:46 a.m. EDT (5:46 a.m. PDT). Media and the public may ask questions during the briefing using #askNASA. NASA’s Ice, Cloud and land Elevation Satellite-2, or ICESat-2, is scheduled to launch Saturday, Sept. 15, at 5:46 a.m. PDT (8:46 a.m. EDT). There is a 40-minute launch opportunity within the spacecraft launch window, which extends for 2 hours, 34 minutes. The 40-minute window is determined by super-cold liquid oxygen temperature (cryogenic propellant) effects on the Delta II rocket. The team is targeting the earliest opportunity within the spacecraft window, which could shift based on launch operations. NASA and United Launch Alliance launch and mission partners are gathered at Vandenberg Air Force Base in California for the final week of final prelaunch activities for the agency’s Ice, Cloud and land Elevation Satellite-2, or ICESat-2. The three-year mission is scheduled to launch at 8:46 a.m. EDT (5:46 a.m. PDT) on Saturday, Sept. 15, with liftoff aboard a ULA Delta II rocket from Space Launch Complex-2 (SLC-2). Launch of the ICESat-2 spacecraft also will mark the final flight of the Delta II, which has served as a workhorse for NASA, the U.S. military and other customers since its 1989 debut. Several significant prelaunch milestones are complete. The ICESat-2 spacecraft has been transported from the Astrotech payload processing facility to SLC-2, where it has since been lifted, mated atop the rocket, and encapsulated inside the payload fairing that will protect it during the first minutes of flight. Tune in Thursday for the prelaunch briefing at 4 p.m. EDT (1 p.m. PDT) on NASA TV, and be sure to follow NASA’s Launch Blog or NASA TV for countdown coverage beginning Saturday at 8:10 a.m. EDT (5:10 a.m. PDT).